A gap occurs when a security’s price jumps between two trading periods, skipping over certain prices. A gap creates a hole, or a void, on a price chart. A Gap can happen in either ways. It can be either a Gap up or Gap down. A gap up occurs when one day’s low is greater than the previous day high. Gap types differ based on the context in which they occur. Some price gaps are meaningful, and others can be disregarded. A breakaway gap is one that occurs at the beginning of a trend-usually after the security has traded in a consolidation pattern, which happens when the price in non-trending within a bounded range. Because profits are made by jumping on and riding a trend, breakaway gaps are considered the most profitable gaps for trading purposes. The gap gives an indication of large increase in sentiment in the direction of the gap, which will likely last for some time, leading to an extended move. The strength of this gap can be confirmed by looking at that volume during the gap. The greater the volume out of the gap, the more likely the security will continue in the direction of the gap, also reducing the chances of it being filled. The Breakaway gap is a good sign that the new trend has started. These types of gaps often occur when a security is trading in a range and will often be small in terms of the gaps price movement. They can be a result of commonly occurring events, such as low-volume trading days or after an announcement of a stock split. These gaps often fill quickly, moving back to the pre-gap price range. A runaway gap is found around the middle of a trend, usually after the price has already made a strong move. It is a healthy sign that the current trend will continue as it indicates continued, and even increasing, interest in the security. After a security has made a strong move, many of the traders that have been on the sideline waiting for a better entry or exit point decide that it may not be coming and if they wait any longer they will miss the trade. It is this increased buying or selling that creates the runaway gap and continuation of the trend. Volume in a runaway gap is not as important as it is for a breakaway gap but generally should be marked with average volume. If the volume is too extreme, it could signal that the runaway gap is actually an exhaustion gap, which signals the end of a trend. The Runaway Gap forms support or resistance in the exact same manner as the breakaway gap. Likewise, the measuring gap does not often fill, and there’s cause for concern if the price breaks through the support or resistance, as it is a sign that the trend is weakening-and could even signal that this is an exhaustion gap and not a runaway gap. Exhaustion Gap forms at the end of a trend and is a negative sign that the trend is about to reverse. This usually occurs at the last thrusts of a trend. This gap generally marks panic or hype. This can also be a point when weaker market participants start to move in or out of the security. To Identify this an exhaustion gap or the last large move in the trend, the gap should be marked with a large amount of volume. The strength of this signal is also increased when it occurs after the security has already made a substantial move. Because the exhaustion gap signals a trend reversal, the gap is expected to fill. After the exhaustion gap, the price will often move sideways before eventually moving against the prior trend. Once the price fills the gap, the pattern is considered to be complete and signals that the trend will reverse. 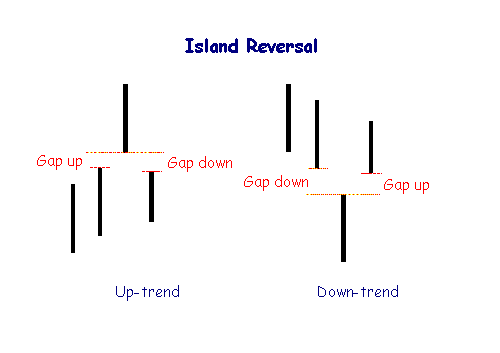 One of the most well-known gap patterns is the island reversal, which is formed by a gap followed by flat trading and then confirmed by another gap in the opposite direction. This pattern is a strong signal of a top or bottom in a trend, indicating a coming shift in the trend. The size of the trend reversal or the Quantity of the signal is dependent on the location of the island in prior trend. If it happens near the beginning of a trend, then the size of the reversal will likely be less significant.